This table consists of a circular top with profusely inlaid ivory decoration of foliate and quatrefoil designs with borders of ivory and foliate and quatrefoil inlaid decoration. The leads down to a moulded edge with inlaid ivory and ebony chevron design and a shaped and foliate inlaid frieze below. To the underside of the top an original makers label can be found 'Kanhaya Lal Brij Lal' Hoshiarpur, India and this company is mentioned in the book 'Furniture from British India and Ceylon' by Amin Jaffer page 286. The table is supported by an elegant turned column also inlaid with foliate decoration terminating on an inlaid tripod base. 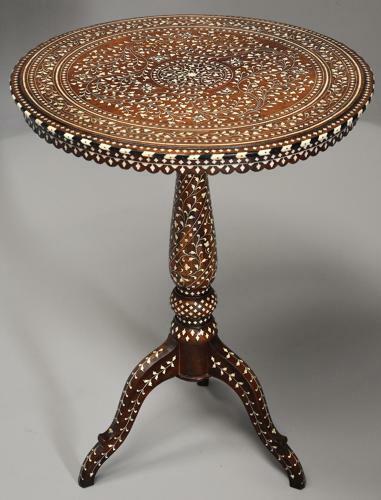 This table is typical of the inlaid designs from the Hoshiarpur region in India of the late 19th century, this area produced fine quality furniture with intricate inlaid designs of ivory, bone, ebony etc.